My friend, Abby, is not only an animal lover but a talented artist. She paints portraits for people of their personal heroes, those who encouraged them to go for their dreams. I love this! My artist friend, Abby, happens to have a cute pet called a Fiddler Crab. I first have to admit that I have never heard of this as a pet, and being a hopeless animal lover means I have had some unusual pets myself. So inquiring minds wanted to know, mine at least! It turns out that a Fiddler crab is a tiny little crab, they only get up to 2 inch max. That includes the claws, so the body is about the size of a dime. Pretty small. Abby has hers set up in an aquarium on her desk, so he can keep her company when she is working in her studio. How do they entertain her? She says that her current Fiddler Crab, Lux, responds to music. She puts some music on and he runs all around the sand, making a spectacle of himself. Most of the time, however, he likes to bury himself in the sand and she doesn't see him much. 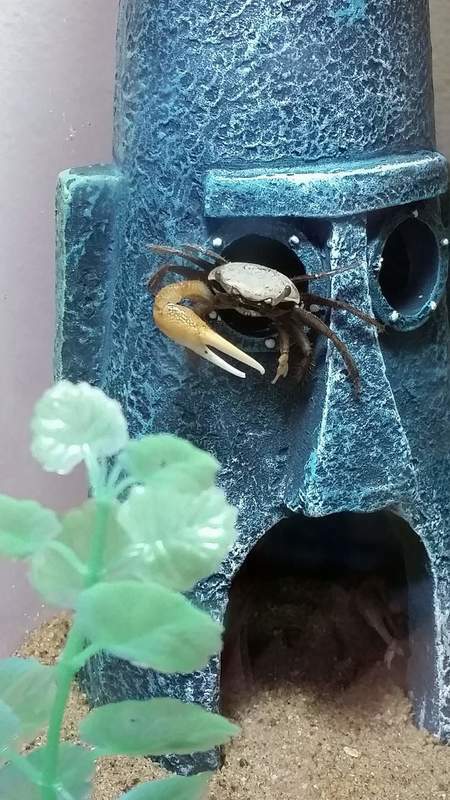 Her first Fiddler crab, Finley, was more active, and liked to stand in his aquarium and watch her when she worked. He seemed genuinely interested in watching things. He only lived about a year, which I found out is pretty typical. My online research indicated they have a 2 year life span in the best of conditions. Which leads to my next question. I asked Abby where she found the Fiddler crabs to buy, and she told me Walmart. I wasn't expecting that! 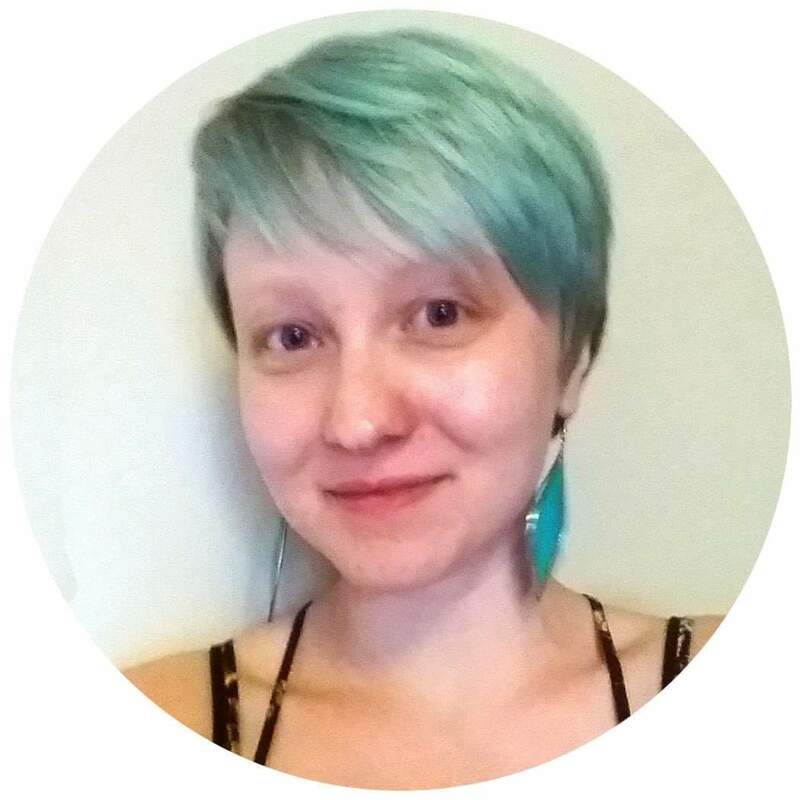 Of course, she lives in a small town in Wisconsin, so shopping may be a lot different than populated California where I live. Abby says that when she buys the crabs, they are in water all the time, and that isn't the best environment for them. So, she feels like she is rescuing them when she brings one home. Here is one of Abby's cats watching her Fiddler crab very intently. Lux is small but you can see him between the tulip bowl and the blue Tower. Click the photos for a larger image. Closeup of Lux showing his climbing abilities. Abby did lots of research online, and found out they do best with a combination of sand they can climb over or bury themselves in, and brackish (slightly salty) water. She has strategically placed rocks under the mounds of sand so that it filters the water as well as using up space. That saves her time having to clean things as often. Salt tablets from the pet store create the right balance of water, and the little guys can eat pet store shrimp pellets. Her crabs also like little pieces of kale, and the occasional freshly-dead insect from her house. To round things out, Abby also happens to have 3 cats. She says each cat has a different personality and it makes for a happy house. Her cat, Teddy, likes to fetch things. Jetta, who is her totally black cat, is very snuggly. 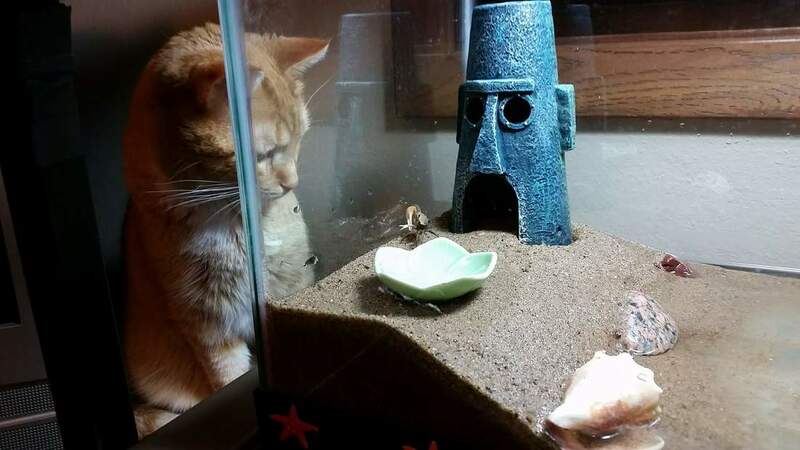 I am not sure what Charlie is most loved for, but he is the mischievous cat staring at the Fiddler crab in the photo. So, while I have no plans of adding a Fiddler crab to my busy household, I have to admit they are surprisingly cute little guys. Comments. Do you think this tiny Fiddler crab is cute?